Pressure snubbers protect your pressure gauge or transducer from pressure spikes and surges and damaging pulsation. Snubbers extend the life of your pressure instruments because they protect the bourdon tube and movement from seeing harsh spikes and surges that could cause failure by rupturing the diaphragm of the transducer or the gauge bourdon tube, or causing the movement teeth to skip or dislodge. Snubbers reduce the day to day “wear and tear” on the instrument, lessening the need to replace. 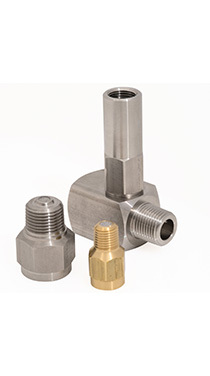 Units are available in both brass and 303 stainless steel, and in three different porosities for various pressure media including gas, liquid, and heavy oil. Overpressure Protectors are triggered to protect you pressure instrument when the pressure exceeds the rated set pressure. A spring-loaded piston triggers a valve to close when the pressure goes over the pressure range, protecting the instrument from a pressure surge or spike. Once the pressure falls back to normal the spring will open the valve again. All units are made of 316 SST for corrosive pressure media. Three different part numbers are available, depending on your pressure requirements.